Time to drive … clients waiting down south. 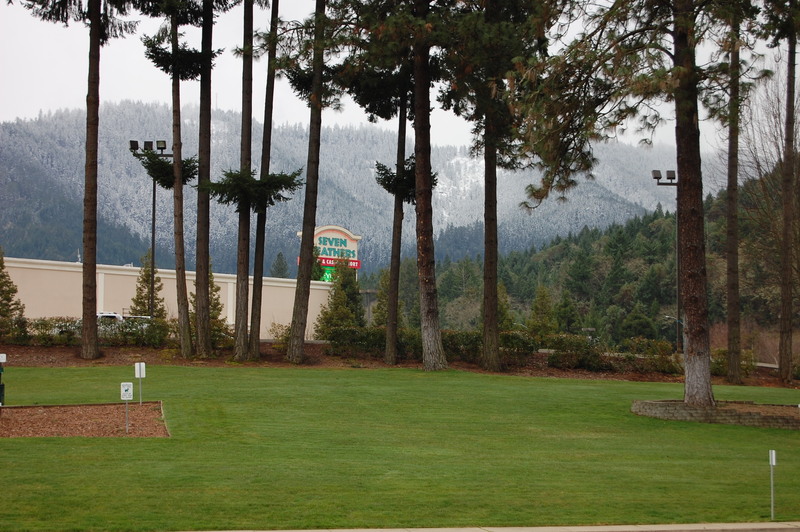 Stayed in Canyonville on I5, at the 7 Feathers Casino. They have a parking area for motor homes and campers … nothing fancy, but well lit and with a little park out the back. It had the feel of a place that is well watched – a safe feeling. There’s a sign says to “check in”, but the main desk said not to bother. Gas is NOT cheap here … do not make this a fuel stop! Took the shuttle up to the casino, checked out the restaurant. The Casino was full, and everyone was active and friendly. Canyonville has a couple of thousand population, and it’s located about 2/3 of the way “down” (that is, south) the state. Several parks are available, and the weather is pretty mild for Southern Oregon. It’s a place worth stopping anytime you’re in the area.